Advanced Pulsed Eddy Current (PEC)! Any plant manager knows that determining corrosion under insulation has been a massive challenge for the industry since the wrapping and coating of selected pipework began. 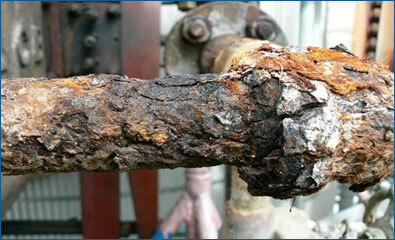 Historically, industry data shows that approximately 60% of pipe leaks are caused by CUI. As a global issue, CUI directly contributes to health, safety, and environmental (HSE) issues, lost production, and increased maintenance costs. CUI damage found on sweating service small bore pipe, 5 years’ service. Until now the only “fool proof” method of determining the extent of corrosion was to remove the insulation and perform visual and ultrasonic methods to determine the extent of wall loss. COTECH now brings to the market an advanced revolutionary Pulsed Eddy Current (PEC) system. Need a quick turnaround? Restricted Access? No problem!!! COTECH management were the leaders in developing Rope Access in the USA some 20 years ago and one of the few companies in the USA that hold both IRATA and SPRAT Approval ( Rope Access Regulatory Bodies) with an approved training center.